Registration is now available for the 2012 St. Louis Alliance for Reentry (STAR) Summit. The annual event will be held from 8 a.m. to 4 p.m. on Monday, March 26 at St. Louis Community College - Florissant Valley, featuring several breakout/training sessions and key area speakers involved in the reentry process. Advanced registration is required. There is a $15 registration fee per person. Lunch and parking are provided. The Summit is hosted by Area Resources for Community and Human Services (ARCHS), Lutheran Foundation of St. Louis, Missouri Department of Corrections, St. Louis Community College, St. Louis City, and St. Louis County. The 2011 STAR Summit will be held 7:30 a.m. to 3:30 p.m. on Tuesday, March 15 at the St. Louis Community College - Florissant Valley Student Center. There is a $10 registration fee and pre-registration is required. The deadline for registration is Thursday, March 10. Walk-ins are not encouraged and not guaranteed. For questions, call 314-289-5625. Registrations will not be accepted at this phone number. Lunch and parking will be provided at the event. 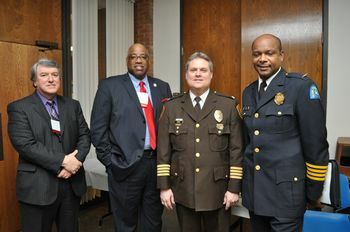 The St. Louis Alliance for Reentry (STAR) Summit welcomed nearly 300 people to its kickoff on March 23. Missouri Department of Corrections Director George Lombardi served as the keynote speaker, and addresses to the crowd were also given by ARCHS' Chief Executive Officer Wendell E. Kimbrough, City of St. Louis Police Chief Col. Daniel Isom, St. Louis County Police Chief Col. Timothy Fitch, St. Louis County Executive Charlie Dooley, St. Louis Mayor's Chief of Staff Jeff Rainford, Missouri Department of Corrections Regional Administrator Nancy McCarthy, Rev. Lynn Mims, City of St. Louis Department of Health representative Dale Wrigley and St. Louis Community College President Dr. Marcia Pfeiffer.